Whether it was online or amongst the smokers on Western and Cortez, there was a whole lot of pre-show hubbub about just how loud the night was going to be. A Place To Bury Strangers have a reputation for playing at volumes that melt fingernails and boil ocular fluid. This is, after all, the band that famously sent earplugs out with copies of 2009's Exploding Head. Hell, they were selling official APTBS hi-fi earplugs at the merch table. There's no doubt that Brooklynite openers The Big Sleep were aware of what they'd be followed by, and boy did they try to compensate. The Big Sleep kicked off their set with blaring, churning guitars and a healthy lump of distortion. The group's muddy, straight-forward rock showed hints of grooves and a cool riff here and there, but their greatest victory came in making sure they simply weren't pegged as the quiet band on the bill. Overcompensating crunch weighed a few numbers down and almost completely obscured the vocals. The most interesting moment of the set came about midway through, when a stumbling, hungover melody shambled over a stuttered drum beat. By this point I'd drifted back towards the bar, and the change up called for me to refocus. Something cool was about to happen. Instead, the melody found the toilet bowl and burst into a garbled sonic vomit. I'm a fan of noise, but as Charles Bukowski said, "if you're going to try, go all the way." The hooks and structure suggested that The Big Sleep might be better as a focused, high-octane rock band. In the end, they came across like a group that had yet to commit either way. Apteka, on the other hand, strike me as a band that has put countless hours in crafting their identity. I know in the age of effort-is-uncool that this might read as a slight, but it is a genuine compliment. With their 2011 release Gargoyle Days popping up on a lot of local "Best of 2011" lists, I was more than intrigued to see what the live show was going to be like. Again the internet butted in pre-show, telling me to expect a psychedelic band. What I ended up hearing was pack of local guys who grew up listening to The Smashing Pumpkins and Jane's Addiction. That should be a combination of influences that has me creaming myself, but it ended up taking me a bit to get into the show. Their opening song featured washy chords and an infectious buoyancy, neatly contrasted by the following boilermaker rock tune. A new song provided a spiraled, ear-catching melody that ended up wasted on a lackluster song. It sounded a bit too polished, a bit too restrained, like you could hear the music wanting to expand, only to have its leash yanked. 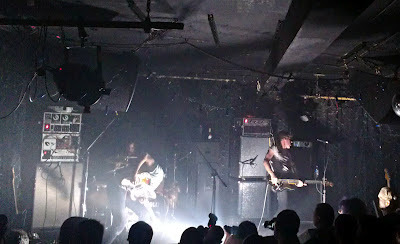 The most "psychedelic" moment came during a pop-shoegaze number during which a swarm of green jellyfish were projected over the stage. That tune also cemented my feeling that singer Adam Lukas really wants to be Perry Farrell. Though less vocally dynamic than the Jane's frontman, Lukas' voice was infinitely more soothing. The last few songs Apteka pulled out sounded like the ones they trusted most, the ones they let meander for a bit before calling back the various solos and jams. Ending with a raucous, deathray closer that borrowed a lot from The Pumpkins "Silverfuck," the set left the crowd buzzing. Enough of Apteka shone past the channeling of late '80s/early '90s Navarro, Corgan, etc. to leave me pretty excited about where they're headed next. And then it was time for the earplugs. The lights went out and Dion Lunadon kicked off the set with a bass line fat enough to require a forklift to extract it from the amps. Bolstered by a cacophonous wave of distortion, the conjured swell was the sonic equivalent of a plague of flesh-eating locusts. 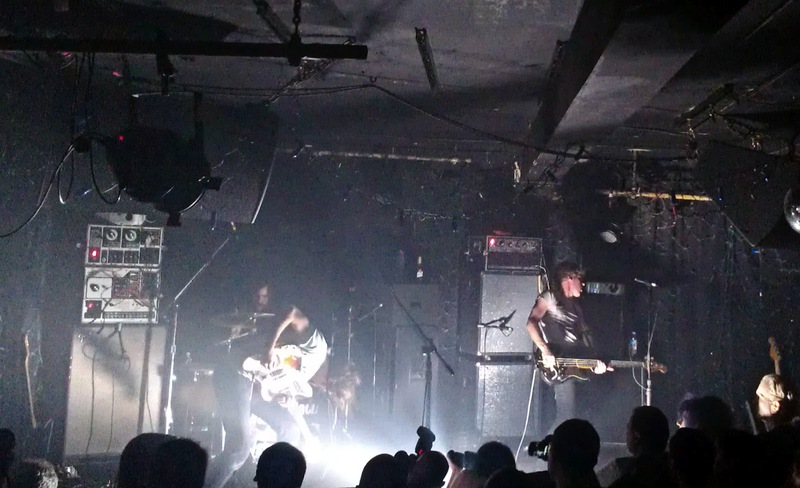 Plastered by manic strobes that put the seizure-inducing ability of Pokemon cartoons to shame, A Place To Bury Strangers exercised a dark sprezzatura in the way they shifted between Attila-like aural pillaging and focused bursts of coke-rock. Jay Space's lumberjack-on-PCP drumming kept the pandemonium anchored, stopping any bouts of noise expedition from dipping into overindulgence. The set, heavy on material from the recently released Onwards To The Wall, showcased the band's ability to entomb catchy hooks in layers of hypnotic dissonance. Often pegged as a shoegaze outfit, the group's live show melds that aesthetic with the sound sculpture mayhem of fellow New Yorkers Rhys Chatham and Glenn Branca. The result is a pseudo-danceable Armageddon, or at least one that gets your extremities jangling. Singer Ollie Ackermann's gossamer vocals lend even the most aurally violent songs a tangible melancholy, so much so that I kind of wanted to give him a hug. He must get that reaction often, as his band left little room for any unwanted displays of affection. APTBS left barely enough time to snag a quick breath between songs, opting to pummel their instruments rather than engage in banter. I don't know how many girls or how many meals A Place To Bury Strangers have lost along the way, but I can tell you it was worth it. They may not have ascended to godhood (yet? ), but they sure as hell went all the way. What a great review! That Bukowski quote is so spot on in reference to APTBS. You rock!